A female voice echoes through the hall. Below, I hang scarves from a ladder whose rungs I have painted aquamarine. I arrange the fabrics in order, raspberry to charcoal. The frayed edges tickle my fingers while I line them up, careful not to pull any threads. I step back and walk around the stand, checking to see if the spotlights’ glare alters the natural look of the linen and leather. It does a little, but it cannot be helped. Once the microphone falls silent old swing songs begin to play, saxophones, trumpets, clarinets and pianos chasing each other through the lyrics. I look around, exchanging a nervous smile with the woman on the opposite stand. The geometric designs of her blankets make me think of Peru. I wonder what her name is. I breathe deeply, hands sweating. Chocolate, candied fruit and cheese linger on the air. Above, tall cones wrapped in gold streamers hang down like chandeliers, while beyond the glass roof of the Kensington Olympia the sun strives to peep through the clouds. Soon different voices fill the hall, all curiosity and questions. People wander between stands and up the white stairs to the gallery, searching for gifts, bottles of wine, perfumes. Two women stop to touch one of my tablecloths – crumpled linen with Acanto designs. I unfold it for them and they tell me it is ‘gorgeous’, all smiles before they disappear. As I re-fold the cloth another woman arrives, this time with a tablet and a briefcase. She tells me she loves my products, that they would be perfect for her magazine, so she takes out a copy and hands it to me with her card before she is also gone. I read the title. Kitchen Bathroom Bedroom. The hall is brighter now. The babble of voices grows. Cameras with microphones fixed on tripods; TV crews from a local station. ‘Me too,’ I say. ‘And it’s only the first day.’ I glance at my watch. It is three in the afternoon. When I look up again a young man is following the design of a table runner with his finger. ‘Sure,’ I say. ‘No problem,’ moving my body out of the shot. He stops to touch the runner again, his open palm dancing side to side. One of the loudspeakers has begun to buzz now, like another announcement might come. ‘And does it have a name?’ he asks, a little louder. ‘The design?’ He digs in his pocket and takes out a notebook. The speakers start to scratch. ‘Wow,’ he says, though I can barely hear him. ‘Ellisse,’ he says, the word sounding different somehow. ‘Can I–’ until his voice dies out to the boom of the gong ringing out across the sea of stands. It was the fourth of August when I first visited Stamperia Bertozzi. The workshop is in Gambettola, a small town in my home region, Emilia-Romagna. Gigi and his family were waiting for me when I arrived, around two in the afternoon. It was a Monday, sunny and bright, and from the hills I could see the waves rippling off the coast of the Adriatic. As I drove along the narrow road I opened the windows of my car. The chirping of the cicadas wafted through the air, the smell from the fields that I had missed so much. I took a long breath. I would be based in the workshop for four weeks in the hope of developing a new design. The Gambettola fabrics had been familiar to me since I was a little girl – I didn’t think I could remember a house in my hometown or a trattoria in the countryside where their tea towels weren’t hung above the sinks or their tablecloths spread over the tables. In her kitchen, my grandmother used to wear an apron printed with purple bunches of grapes. So when I started my own business, I already knew I would contact Gigi. At the first crossroads I turned right onto Via Emilia. Even though I knew the route so well, this time it felt different. I was nervous. Soon the houses began to thicken. More vehicles travelled in both directions, South like me, and North. After ten kilometres I indicated off the main road for Gambettola, the home of the Stampe Romagnole for the last five hundred years. 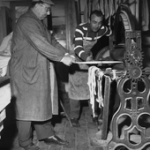 The Stamperia was founded by Gigi’s grandfather, Luigi Bertozzi, in nineteen twenty. I parked the car in the shade of a tree. Above the entrance, the old rusty sign hung proud against the sky, the caveja and two cockerels on top, my region’s emblem. Figure 1. The original sign. He looked exactly the same as when I first met him a year ago, only a little ruffled in his black apron stained with splashes of bright paint. A red one smudged his beard, though I didn’t tell him, only that I was very happy to be there. The room was bathed in natural light coming in through the large windows, hitting the white walls and terracotta floor. Tablecloths, scarves, blankets were piled on wooden shelves, while cushions were arranged on two armchairs near the table. ‘Well come here and sit.’ His voice was husky with a strong regional accent, the stress on the vowels and the unmistakable s slipping away into a z. ‘The only thing you need is a real caffè and a slice of ciambella.’ It reminded me of my grandfather. I laughed. And when I bit into my ciambella I felt good. Afterwards, as Gigi gave me the grand tour, the first thing I noticed was a funny smell, almost like vinegar. It made me feel dizzy. But when I asked Gigi he smiled and told me that vinegar was indeed one of the essential ingredients. ‘For the colours, you know?’ I looked at him, surprised. I wanted to know more. But then towards the end of the corridor I heard a strange sound, louder and louder as we took the stairs down. Rows of tables filled the room, each made of bricks or wood. Above, printed tablecloths fell from the ceiling, while other linens hung from easels like paintings, a feast of blue, green, red and orange. I walked towards a table to watch. 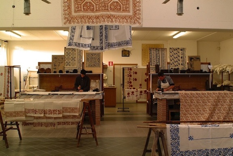 A stampatore was hand-printing a huge tablecloth with a modern floral design. He used wooden blocks of different sizes according to the pattern, his hands so firm and precise each time he struck with his mallet. What impressed me most was his ability to print by heart. By feel. There was no drawing, no stencil. Block after block, centimetre after centimetre, he created the intricate pattern, only sometimes using a wooden ruler to measure the distance from the borders. And the more I watched, the more I realised each hit varied in intensity – light and delicate sometimes, heavy and deep at others. Gigi told me it depended on the specific design and its colours. I had my camera with me and asked if I could take some photos. ‘Yes, of course.’ I took out the machine and began to focus the lens, but then I noticed the stampatori never looked up, their eyes fixed on their hands clutching the blocks. They worked patiently, without saying a word. I put my camera back in my bag. I didn’t want to spoil their hush. I felt like an imposter all over again. As Gigi stopped to check a tablecloth, I walked towards the other side of the room. Maybe it had been a mistake to come. Everything looked so different from how I had imagined it. Would I be able to manage? To meet everyone’s expectations? I was curious, so I took one of the blocks from the shelf. It was heavy and my hand too small. The design was rustic, sunflowers and ears of wheat. I immediately recognised it. At home we had a printed breadbasket, exactly in this style. As I put it down, Gigi showed me other blocks he had hand-carved. They were all pear wood, the hardest and most resistant to the mallets’ pressure. He told me that his grandfather, Luigi, had taught his father the art of carving when he was just a little boy, and then in time, Pierpaolo had taught him too. ‘I still use the same tools and techniques,’ he confessed as he touched a block carved with cornucopias. I noticed the rims of colours around his nails. Figure 3. Gigi Bertozzi hand-carving a block of pear wood. After the stampatori we entered another room. It was sweltering and I began to cough. ‘The steam,’ Gigi laughed, pointing to the macchina a vapore, a huge smoking cylinder. ‘To fix the colours.’ It looked like a pot used by witches to prepare their potions. I didn’t look at my watch. I wasn’t in any rush. Figure 4. The steam machine. ‘It needs to breathe,’ I said in all my inexperience. ‘Exactly!’ He checked the needle, then his watch. I nodded as he opened the lid, clouds rising into the air. I waved my hand, like flicking mosquitoes away. Inside, the brown tea towel had turned red, the green table runner indigo. I looked at Gigi, satisfied. ‘Come on,’ he said, leaving the room behind. The smoking pot had performed its magic spell. When we reached another door we began to walk up some stairs. I tried to retrace our steps so far. My sense of direction was very poor. ‘So do you know much about the history of this place?’ Gigi asked, and before I could answer he was talking again. We crossed a room as Gigi explained that Gambectola was a valorous soldier who had fought and won many battles. ‘So Caesar rewarded him with a centuria – the plot of land where we live now.’ He stopped and opened another door, the walls of the small room inside like convoluted murals. The oldest and most traditional was called ‘rust’, but to protect the tradition, to keep it safe from commercial counterfeits, only eight stampatori in all of Romagna knew the recipe. ‘Some ingredients,’ he told me, winking. ‘Are still secret.’ He closed the door, keeping the secrets safe. Figure 5. The rust colour (from the Stamperia archive). ‘And finally,’ Gigi said, turning another corner. ‘The fabrics. Where everything begins.’ We walked along the corridor, lithographs of Gambettola hanging either side, until we reached the last door. I stood on the threshold, adjusting my eyes to the new light before I entered the most spacious room so far. Rolls of fabrics were piled on shelves to the ceiling, their different shades warming the walls. Milky-white, ivory, cream. Near the windows were three long tables, and bent over one was Pierpaolo, cutting a piece of linen with a pair of scissors. Like a tailor, his hand was steady as he followed the edge of a wooden ruler. He didn’t turn. I didn’t speak, only admired his patience. Meanwhile Gigi had unfolded some rolls over another table. Hemp, straight and crumpled linen. I touched each of them in turn, felt their thickness and their softness. I decided the crumpled was my favourite, so natural and light I would have happily wrapped myself in it. ‘It depends on the motif.’ He explained the crumpled linen was more suitable for delicate or contemporary designs. I touched the fabrics again. ‘Gigi?’ I looked up. ‘Don’t worry,’ he said, as if he had read my mind. ‘Tomorrow will be exciting. From theory to practice.’ He smiled then and we exited the room, leaving Pierpaolo and his scissors behind. Gigi walked me to the front door and stood on the steps as I got into the car. He waved and I started the engine. Soon, I was driving along Via Emilia again, this time North. Suddenly I felt alone. I sped up and tried to keep my mind on all the things Gigi had told me. I didn’t want to disappoint him. He had always been so kind, so excited about the project. But now the idea of reviving an old design seemed so remote I could hardly imagine it. I parked the car and got out. The countryside was quiet, only the sound of my footsteps towards the door and the chorus of the crickets for company. The smell of vinegar had followed me all the way home – my clothes, skin and hair seasoned like salad. I had lost my appetite and took a long shower instead. Once dry, I sat at my laptop. I was curious, so I searched for Gambectola, the centurion. And I was surprised to see that there was a website named after the valorous soldier. I clicked the link, and Renaissance music began to play. I began to reread the things that Gigi had told me about today; the history and the rust-printing that reached back to the Roman Empire. ‘Since then, the “alchemist-dyer” has practised this chromatic art, jealously guarding its secrets for centuries.’ Beside the text was a picture of two men in medieval clothes, stirring a mixture in a huge pot. I thought of Gigi working secretly in the room of the colours and I laughed. The bad mood had finally left me. I switched off my laptop, and exhausted, I went to bed. The next day I was fresh as Gigi showed me the room of the old blocks – or the ‘forgotten blocks’ as I renamed it later. But my mood didn’t last long. I stared across the room at the unstable shelves, hundreds of blocks stacked up in disorderly piles. I turned to Gigi. I nodded. He smiled and left the room. When I looked around, though, again my worry only grew. So this was it – time for me to find a block with an old yet contemporary design – all in just a couple of days. After pacing the room I stopped, took a long breath and decided to start from the left. Figure 6. The room of the old blocks. The blocks were covered in dust; some worm-eaten, others so worn I could barely see the original design, a musty smell rising in the air each time I picked one up. But I continued, patient, through little roses, harmonious birds, stylized flowers, squares and circles. As I looked at them, touched them, I felt the passage of time, ideas and tastes changing over the century. The following day, on the bottom part of a shelf I noticed a simple, delicate design. It looked like waves. The block was very old, worm-eaten with cracks, but the more I stared at it, the more I liked it. I called Gigi, but Pierpaolo told me he was out at the moment. ‘Have you found anything?’ he asked. ‘I think so.’ I handed him the block. ‘Grazie,’ he said. ‘I’m happy you found it.’ Then he asked if I fancied a slice of crostata. I smiled. We both bit into our crostata. He said that the design had only been used for a couple of years or so before it was lost. ‘Its name was… is Ellisse.’ He stood up. ‘I want to show you something.’ He walked towards a cabinet and began to rummage before he turned, holding a thick notebook, a rolled yellowy poster and some photos. He showed me the old catalogue with its cardboard cover, and the page with the Ellisse printed on it. As he handed it to me I felt a hint of pride. I asked him if I could take a photo. Figure 7. The original Ellisse block and the old paper catalogue. Afterwards, he handed me a picture of his father, Luigi. He was working with a mangano; an old machine used to iron the dry hemp by hand. ‘The hemp is stronger and thicker than linen.’ I stared at Luigi. We didn’t say anything more. Figure 8. Luigi Bertozzi (from the Stamperia archive). Charlotte Hjorth-Rohde would arrive from Denmark on Wednesday. I knew that she was a designer and photographer; that she had started to work with Gigi about a year ago; and that she would help me develop the design. My mind filled with questions – what she looked like, if she was friendly, what brought her here from so far away and why? Somehow, she was an outsider like me, maybe even more. At least, that’s what I first thought. I spent the following days trying to feel what the stampatori had felt every day for years. ‘You need to sense it with your hands. It’s important,’ Gigi told me. He gave me a block of the right dimensions, carved with a pomegranate, and a mallet. He spread a piece of linen over one of the tables and placed a pad soaked with red paint on the shelf next to me. My face glowed as I hit the block for the first time. But when I lifted it and checked underneath, only half the fruit was printed on the linen. I tried again, tightening my grip around the mallet and pounding it down. Too strong; smears of red lay on the linen like squashed tomato. I looked around. A stampatore was printing with a block the same size as mine. I studied him, and then like him I gave two quick hits right in the middle of the block. This time when I lifted it, I smiled at the round, succulent pomegranate on the fabric. I printed them right across the linen, without any pattern or measurement, until no more white space remained. I walked around the table, looking at my first printed creation – a stall of half-eaten, beautiful red fruits. I felt excited. By now the sound of the mallets had stopped being just a noise to me. Along the corridors, up and down the stairs, I heard the orchestra of the stampatori playing, the rhythm changing from slow, pulsating beats to the rolls of a drum. And then Charlotte arrived, tall and thin in her white apron covered with orange, pink and grey splashes of paint – her favourite colours, I thought. She spoke English with a hint of a Nordic accent, and her large eyes seemed even larger behind her glasses, her smiles and gestures revealing a mix of confidence and shyness. Gigi placed the old block on a table as we all sat down to talk about the project: if Ellisse could be developed into a more contemporary design; if it was suitable also for bath and bed linen; if it needed to be lightened. Soon I found myself asking questions in English, answering in Italian and vice versa. My head spun as I tried to find the words, build the sentences and translate. He smiled and soon disappeared along the corridor leading upstairs. She stood up and took some paper sheets and two pencils from a shelf, one for each of us. I looked at her shaking her head, taking a new sheet. I tried to draw too, even though my hands had never been confident. I sketched overlapping waves that looked more like stylized seagulls’ wings. ‘See, it’s not difficult,’ she reassured. Afterwards, she showed me one of her ideas. The Ellisse design ran down the middle of the sheet and along one of the edges too. I told her I liked it. A lot. Days flashed around the table, old sketches and new ideas, each step forward leading to another step back. And I began to wonder if we would be able to finish in time – it seemed the longest brainstorming session I had ever known. As soon as we walked in, Charlotte asked Gigi if he had a piece of damaged linen we could use for the tests. Gigi smiled and spread a wide fabric with a little hole along the border across the table. ‘Here’s the blue,’ he said, putting the pad on the shelf next to us. She lifted the block and we both stared at the blue Ellisse finally printed on the linen. I called Gigi. He was excited as a little boy, and when he checked the block he said we could continue with it for now – apparently even in its ripe age it was still strong. We printed Ellisse twice, almost overlapping the design and using the same colour according to the tono su tono technique. Then we began to develop the crossed Ellisse, this time using two different colours, the grey for the first pattern and the orange for the second. The two motifs, crisscrossing in the middle, created the effect of movement. The old design was turning into something new. After several tests, the day finally arrived when we had to choose the fabrics. We all agreed on hemp and crumpled linen. Soon the first samples were finished and dry, and the macchina a vapore was ready. Gigi did the all procedures correctly, but I noticed that Charlotte was tense and so, as we waited, I asked her if something was wrong. ‘Today is very hot, the colours can change according to the temperature, you know? They are like wine and olive oil.’ I laughed, but it didn’t last long. When Gigi opened the lid and took out the fabrics, the colours were flat, the blue one changed to a deep, dull green. 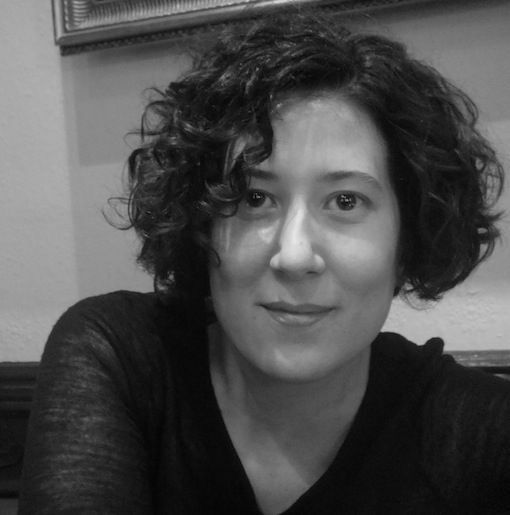 Federica Lugaresi is an Italian native now living in London and enjoying her final year on the Creative Writing BA at Birkbeck. Her work has been shortlisted in the Fish Publishing Short Story Prize and the BlueCat Screenplay Competition. She is writing her first novel Do You Know Marta? Her other great passions are Cinema, food and tennis.